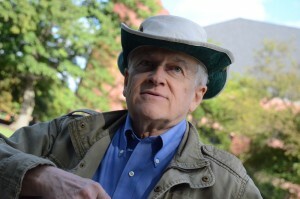 In this first Next Page column of the 2015-16 academic year, Professor of Sociology Charles F. Emmons shares who has influenced his career in sociology the most, which authors would top his guest list to a literary dinner party, whose book recommendations he values the most, and offers titles to read to learn more about paranormal and spiritual phenomena. and finds comic books of great help when learning new languages. What are you reading now (or have read recently) that you would recommend? Why? One of the books I’m currently reading is Dear Committee Members by Julie Schumacher (2014), a fictional collection of letters of recommendation by a jaded professor of creative writing. As a satire on academe it is absurd yet dangerously near the truth. A creative writing professor herself, Schumacher’s style is brilliant, which is the main factor that draws me to any book. You spent two weeks in Italy this summer and then a three week cruise in the Eastern Mediterranean. What did you read to get prepared for that trip? Any novels set in that part of the world? A good travel account? What did you read on the cruise itself? The first thing that occurred to me was to brush up on my Italian, because I’m a language addict, and the best part of any trip for me is engaging with the language. Out came the Italian grammar, dictionary, and comic books (a great way to learn a language, along with films). I tried to find things on Venessian (the language of Venice, closely related to but not Italian), but all I could get was material on the dialects of Italy in general, which helped. Once in Venice I bought two books on Venessian, written in Italian and Venessian (great fun). I also talked with a waiter there who spoke it, but I still know very little so far. On the cruise I read very little (too busy playing the trivia quiz in the pub with the Brits on the Queen Victoria), but I did enjoy Blink by Malcolm Gladwell. I love all his stuff, 40% of which I could assign to my sociology students. I know you are interested in the history of science and New Age exploration, and in fact, teach a course with a similar title. Tell me what that means. Who is your favorite author writing on this topic? My course (“Science, Knowledge and the New Age”) is about the sociology of science and knowledge with emphasis on “normal” vs. “paranormal” science. To me the most significant theoretical works in sociology relating to the subject are Science as Power (Aronowitz, 1988) and Frame Analysis (Goffman, 1974). I once attended a lecture you gave on a range of paranormal topics and alternate knowledge systems and thought that there must be an interesting reading list on this topic. What authors, books or articles would you most recommend? Dean Radin ( Entangled Minds: Extrasensory Experiences in a Quantum Reality , 2006) is the foremost researcher in parapsychology today with his laboratory evidence for precognition. Russell Targ ( Do You See What I See? : Memoirs of a Blind Biker , 2008), a pioneer in laser development and one of the directors of the CIA remote viewing project at Stanford Research Institute, has the most interesting stories to tell. Elizabeth Lloyd Mayer (Extraordinary Knowing: Skepticism and the Inexplicable Powers of the Human Mind, 2007) does an excellent review of how studies of the paranormal became marginalized. Sociologist Andrew M. Greeley (in a 1991 article, “The Paranormal Is Normal”) discusses how people have these experiences in spite of what mainstream science says. Are you a reader who reads a book over and over again? Which books stay fresh with each reading? Are there particular books do you find yourself returning to again and again? My personality doesn’t like repetition very much (except with musical favorites). I can’t think of a single book I have reread (other than for a test or looking up a reference). Yes I can, The Wind in the Willows , and The Hobbit , many years after the first reads. Are there magazines that are part of your leisure reading world—any weekly or monthly periodical that you look forward to? Sadly magazines have disappeared from my busy world. I do read a couple of articles each day from email links to newspapers and magazines. Long ago I used to have subscriptions to Harper’s , Time , Fate Magazine , American Heritage , The Gettysburg Review , (several sociology journals), and others. You’ve also taught a course on and off since 1985 on the Sociology of Mass Media and I was struck by how the course description changed over thirty years. Since mass media is one of your research areas, what mass media do you employ (and enjoy)? For example, are you a big blog reader? News online? What can you say about mass media and our reading culture? I am very visual and consume lots of Netflix movies (DVDs by mail), especially documentaries and British productions. Films in other languages are great; even languages I don’t know. My guilty pleasure is certain sports on TV, especially University of Illinois football and basketball. I’m also very auditory and have thousands of CDs and vinyl (favorite genres: pop jazz of the 1930s and 1940s, classical instrumental music, and 1980s progressive rock). I read news online daily ( NY Times , and Truthout ). Although my son drew me into writing blogs and using Facebook and Twitter to plug one of our books, I have concluded that it’s a waste of time I can’t afford, and I go on social media only about three times a year now. I do read retired sociology colleague Jean Potuchek’s blog on retirement (“Stepping into the Future” ); she’s great. I have a love-hate relationship with popular culture and mass media. I don’t even like electronic books very much; give me the real thing. And see Sherry Turkle ( Alone Together , 2011) on the dysfunctions of internet culture. What, in general, are your reading habits? Do you read electronic, or print? Write in the margins, or keep your books clean? Keep books, or give them away? I think I have read only three electronic books. If it’s my book, I write lots of marginal notes, and I like reading used books with other people’s comments in them (not to mention ephemera like to-do lists and old valentines hidden between pages). It’s hard for me to get rid of books, but I jettisoned about 80% of what I had when Sociology moved offices three times in three years. In our cottage in Lily Dale, I have a curious collection of obscurities for rainy days. One other reading habit. I read a bedtime story (about 10 pages) to my wife Penelope every night. It started out that we took turns, but for many years she has made me do all the reading. I like to imitate voices and dialects (makes her laugh). If I ever retire, I might like to read books aloud on NPR. Current bedtime book: Death Comes for the Fat Man (Reginald Hill, 2007, the Dalziel and Pascoe series). Where do you tend to get your books? Do you have a favorite bookstore? Are you a library person? Own or borrow? I wish I could say that I buy most of my books from wonderful bookstores like The Tattered Cover in Denver, but mostly I buy online from Amazon for convenience. I love used bookstores, like the Acqua Alta bookstore in Venice, named jokingly for the “High Water” seasonal flooding, that keeps many of its books in bathtubs as a sight gag. Growing up in Erie, PA I bought as much as I could afford from The Erie Bookstore at their semi-annual used book sale. If only I could spend more time in the library. As a kid I spent half of every Saturday in the Erie Public Library (right after half a day of poker with my friends) and went home with as many books as I could carry on the bus. Now I load up on books in Musselman Library (mostly for research, sigh) at the beginning of summer to take to Lily Dale, NY. Shockingly I have not been to the libraries here in Cassadaga and Fredonia, NY, even once this summer. Too busy. What kind of books are you drawn to? Any that you steer clear of? I will read anything recommended by Jean Potuchek. Her tastes are uncannily similar to mine. She has introduced me to Bill Bryson, Alexander McCall Smith ( 44 Scotland Street series especially), and Julie Schumacher, for example. It matters a great deal to me that a book is extremely well written. Rarely do I enjoy a book that is poorly written on an interesting subject (I can think of only a few). John Gardner was gloomy but a fabulous writer. As with films, I prefer nonfiction to fiction, but I wish I had more time for fiction because I spend so much time reading for sociological research and teaching. Probably I would like only about 5% of books on the market (I’m this picky about music too), making it much easier just to go by the recommendations of people (like Jean) who have similar tastes. Who needs The New York Review of Books? Which books might we be surprised to find on your shelves? I am a bibliomaniac. I especially like beautiful old books. My oldest book is about the life of Alexander the Great, written in Latin by Quintus Curtius, published on Paternoster Row in London in 1658. I bought it from the Erie Bookstore in about 1956 for $3.50. It’s on rag paper, perfectly preserved, bound in white leather. You might also be surprised by my collection of comic books (that I continue to read) in Italian, French, German, Modern Greek, Catalan and Spanish. Most are vintage Disney comics (in translation), and I find them great fun as well as a great way to learn languages. What book or article has inspired you to take some sort of action? Or what book or author has had the biggest impact on you and why? You’re hosting a literary dinner party. Which writers (living or not) would you most enjoy chatting with? Who would you invite? Absolutely first on the guest list would be Aldous Huxley (I think I have read just about everything he wrote, not justBrave New World). His 700-page biography by Sybille Bedford made me feel like I knew him personally. I want Sybille there too. Some like-minded living people would be Michael Murphy (Golf in the Kingdom), Jeffrey Kripal (Esalen: America and the Religion of No Religion), and Edith Turner ( The Hands Feel It). Apart from the fact that I am reading four books concurrently at the moment (is this a bad idea? ), I can hardly wait to start Inside the Closed World of the Brain: How brain cells connect, share and disengage – and why this holds the key to Alzheimer’s disease (Margaret T. Reece, 2015). I got this 5 days ago from the author at my 55th high school reunion, and we had a great chat about it. I know very little about brain physiology (she has her PhD in it). Having read the literature on consciousness and how neuroscience knows zero about it (she confirmed that), I’m curious about how we might link subjective experiences of “paranormal” consciousness with neuroscience lab studies. What kind of reader were you as a child? What were your favorite childhood books? Thanks to my godmother, Grace Nunn, the most influential adult in my childhood, I read a lot. When I was home sick from school, which happened often, “Aunt” Grace, who was principal of three elementary schools at once, would bring me a huge stack of books to read. I was like a kid in a candy store. Ironically I also loved comic books (mostly Disney; my parents banned the horror and naughty kinds), which in those days (1940s and 1950s) were accused of rotting out the minds of youth. I also liked the Classic comics, which people thought would discourage kids from reading the real thing. I just read everything, including comics. I don’t think my childhood ever ended, because I still like children’s books, of which I read a great many to my own kids. However, I especially liked Uncle Wiggily books, the Homer Price series, and another funny series about a pig. I read many classics, but that genre was not my favorite. I liked humor and then science fiction by the fifth grade. Probably I liked Toad best, with his canary-colored motor car ( The Wind in the Willows , Kenneth Grahame, 1908). He was not a media role model however. I was unusually well behaved as a child.